Hey Gang. It's been a while since I've posted. I've searched a bit before posting, but didn't find anything that spoke directly to this situation. I'm in the process of acquiring some land to build a house on someday- a 44 acre parcel. 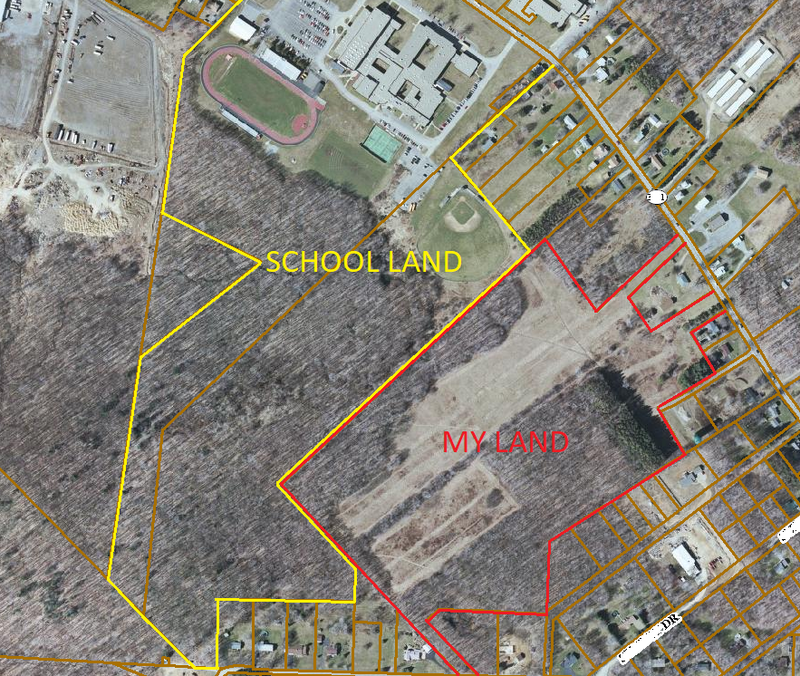 The property shares two of it's borders with a public high school. This school owns a lot of property. There are times when I may venture onto their wooded property, which is over 1,300 feet from the occupied buildings. I imagine it would probably be frowned upon/illegal to carry anywhere on a property owned by a school, regardless of distance from structures. How about my own land? What about discharging a firearm on my own property (as long as it meets the 150 yards from occupied structure requirement)? Attached is link to the map of the layout. School property in yellow, mine in red. I reckon you'll find out 15 minutes after the first shot. On private property, not part of school property, you are GTG. In the exceptions listed in this link, you should be able to discharge your firearm(s) on your property if there is no other state, county, or township restrictions. IANAL. As written, the law prohibits (subject to court interpretation) firearms on school grounds, not school property. Tbe laws supposedly say what they mean, and mean what they say, so there is a difference between the two. Where the former ends and the latter begins, if the lots are contiguous, might require legal intervention (not cheap). As far as 'venturing onto school property', I'd have a survey done (if needed) and post your property line. This serves as a reminder to others to stay off yours, and for you to stay off theirs, so there's no 'gray area' about you having a firearm on school 'grounds' or even 'property'. Legally you're OK to shoot on your property, but expect visits and maybe some publicity when people at/near the school report hearing gunfire. I'd make a connection with an attorney for when that happens. I get the following in this order detailed survey, then post every 500 ft so you know where it is, Suppressor, and a good lawyer. If you don't use the first two your gonna need the third. I believe that that would depend on where the shootin's happening at. I called my twp office and they told me that they go by the hunting regulations. The tile of the PA law says school property.......and in the explanation of the offense includes buildings and grounds. If you think you can win a legal battle by saying your on school grounds and not school property or vice versa.....good luck to you! My advise, dont try going onto the property. Also, the Gun Free School Zone Act.......says school zone......in essence, a giant bubble 1000’ around the school property. Now, if you are on private property within that bubble, you don’t have to worry about it.